The first thing people tend to ask when they hear the name Halfway, Oregon: what is it halfway between? Well, there are lots of answers to that, and like most historical things, they are at least somewhat based on an element of truth. 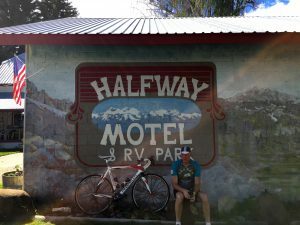 Halfway is halfway between Heaven and Hells Canyon. Halfway is halfway between the cities of Pine and Cornucopia. Halfway is halfway between the equator and the North Pole. All pretty much true–take your pick. To further confuse the name issue, there was also a brief time when Halfway wasn’t called Halfway. For the span of one year, starting in 1999, Halfway, Oregon officially changed its name to Half.com as a publicity stunt for an early dot-com business. The town had a short-lived run of prosperity and notoriety from the name change before Half.com was bought by eBay and lost all relevance like so many free AOL trial discs piled up in a warehouse somewhere. Beyond the name, the real story behind Halfway has to be its breathtaking surroundings. Located 54 miles east of Baker City along Oregon Route 86, Halfway is tucked in along the southern base of the Wallowa Mountains and the Hells Canyon Scenic Byway (a distinguished All-American Road). Historically home to farmers, miners and ranchers, the main draw these days is the non-stop scenic splendor and recreational opportunities available in the area. 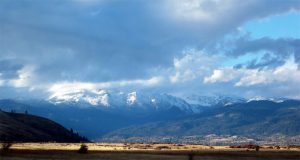 Being fully ringed by the Wallowa-Whitman National Forest, with the Eagle Cap Wilderness to the north and Hells Canyon National Recreation Area to the east, there is outdoor fun in every direction. Hiking trails like Sawtooth Crater and Horses Lake/Bucktooth Crossing offer up some amazing views. Rafting and jet boating on the Snake River in Hells Canyon are great summer activities to get your adrenaline pumping. For cyclists, the Blue Mountain Century Scenic Bikeway is about as good as it gets. And when the mercury drops and the white stuff starts falling, snowmobilers come from all over to play on the area’s hundreds of miles of groomed trails and wide open spaces. 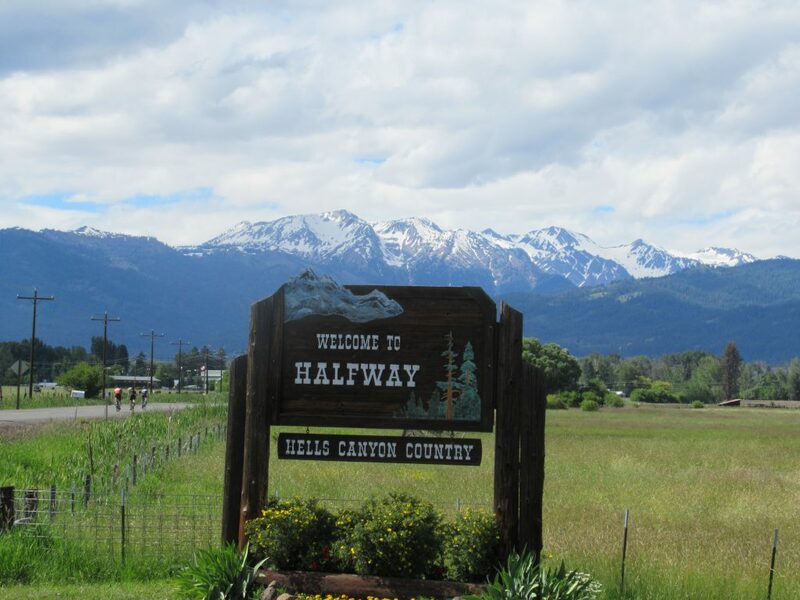 Halfway is located in what locals call a “snowcatch”, which means that they get 3-5 feet of snow a year while towns like Richland, just 12 miles away, only get a few inches. Good news for snowmobilers, bad news for snow shovelers. And if none of those activities catch your fancy, we have one word for you – llamas. An outfit called Wallowa Llamas leads guided small group tours of the Eagle Cap wilderness, bringing trusty llamas along to carry all your gear! This is definitely a unique adventure worthy of anyone who feels like they’ve “been there, done that” to everything else. When you’re ready for a break from exploring the great outdoors, the 337 residents of Halfway really know how to make a visitor feel right at home. Out-of-towners can find a home-style meal at Wild Bill’s or the Main Place Café and Grill, and tasty baked goods at Nella’s Kitchen or Dry Creek Bakery. When it’s time to get some shut-eye, you can find comfy beds at the Pine Valley Lodge, Hells Canyon Inn, The Halfway Motel & RV Park or The Clear Creek Farm Inn Bed and Breakfast. Halfway also hosts a handful of fun annual events that are well worth making the trip out for. In March, there’s the Crab Feed and The Pine Fest Music Festival (awarded the Best Music Fest in Oregon in 2016) and the historic Baker Country Fair and Panhandle Rodeo both happen in early September. 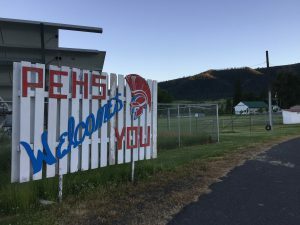 The fair and rodeo have long been an important part of the community and in 2005, Cycle Oregon donated $50,000 to the Pine Valley Fair Association to help save their fairgrounds during some particularly hard times. For a friendly homebase for every kind of adventure, in the middle of some of the most spectacularly beautiful country anywhere, you really can’t beat Halfway, Oregon. Looking to retire there, thank you for the information. Kenny sgt. US Army disabled.